Here are the houses and characters that are represented in the Game Of Thrones x Adidas Ultra Boost line, clockwise from top left: House Lannister, House Stark, White Walkers, Daenerys Targaryen, House Targaryen, and the Night’s Watch. 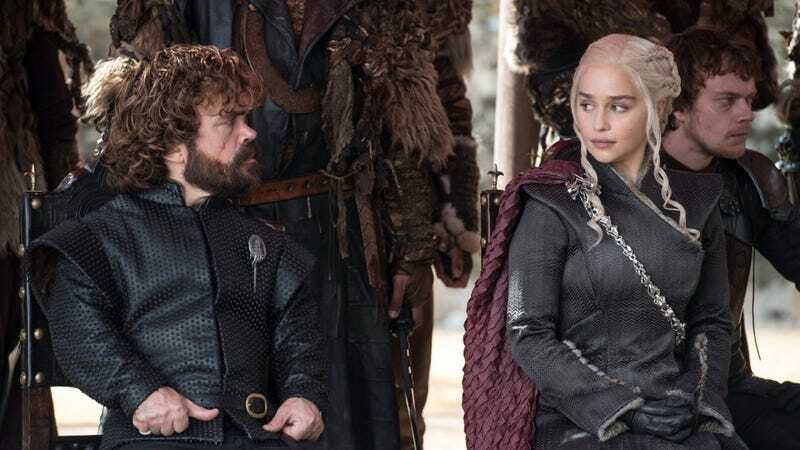 The Lannister sneakers are red (for either blood or wine) and gold (because obviously), while the Stark set come in a brooding grey to match the family’s overall demeanor. The White Walkers get an icy blue, white, and black set, while the Mother of Dragons gets a pair of sneakers with an aesthetic that can only be described as “charbroiled Whopper.” The black-and-white look makes sense for the Night’s Watch, though I would’ve appreciated a dagger and maybe a smidge of blood, or at least an orange trim to represent Tormund’s beard. As for the Targaryen sneakers, white is fine, I suppose. It does match their whole creepy Village Of The Damned vibe. Adidas will release the sneakers sometime this spring, hopefully before the final season of Game Of Thrones premieres on HBO in April.